For information on trucks using a combination of internal combustion engines and electric propulsion, see Hybrid electric truck. Electric Renault Midlum used by Nestlé in 2015. An electric truck is an electric vehicle powered by batteries designed to deliver cargo. Electric vehicles first started to be created and socially accepted around the early 19th century. Electric vehicles had a competitive share of the market and much of early america was using electric vehicles. Companies used silver-zinc batteries on their experimental cars because it was the most advanced for propulsion technology. During the Second World War, businesses in the transportation industry were inventing ways to transport goods. Electric trucks were one of the creations and thousands of them were transporting goods reliably, safely and efficiently. The Walker Electric Truck were battery-powered trucks and were built from the years of 1907 to 1942. The eventual interest of building electric vehicles had died down around the 1950s and companies had started to produce gas powered vehicles. Ford had produced the Model T and companies saw combustion engines as the future and more applicable. Electric vehicles were appealing because they were clean but they were quite expensive to make, slow and did not have a far range. The societal interest in electric vehicles disappears and emerges depending on what is going on in the world. While the Arab oil embargo was going on, development in the EV or electric vehicle industry was high. Society in 1980 was concerning over gas emissions and the environment so the EV industry saw another traction of interest and development. Electric vehicles were developed early on and in the 20th century they have gained a significant amount of interest and traction. The world sees EVs as a viable alternative and solution to gas-powered vehicles. Tesla has showed the world that EVs can perform just as well or even better than combustion engines. EV. Electric trucks and semi-trucks have gained popularity and are what many companies are creating. Electric trucks have been around in niche application areas for over a hundred years, but more recently the advent of lithium ion batteries has enabled the range of electric trucks to increase to several hundred miles, making them of much wider applicability. Electric trucks are becoming an alternative to traditional trucks, while creating no local pollution. Due to the high efficiency of electric power trains, running costs are expected to be lower. Their simplicity is also supposed to make maintenance costs much lower. According to the United States Department of Energy, the cost per kWh capacity of battery packs for trucks fell from $500 in 2013 to $200 in 2019. A few electric general lorries prototypes or produced by small manufacturers, and often converted Diesel units, have been built until the 2000s. Trials with different companies in real-world conditions, for several months or more, have been conducted, for example with Renault, E Force and Emoss heavy-duty lorries in the 2010s. Renault launched its small electric Maxity in 2010 and Mitsubishi Fuso its slightly larger eCanter in 2017. From 2018, other major manufacturers including MAN, Mercedes-Benz and DAF began deliveries of prototypes or pre-production heavy-duty units to companies for real-world testing. In 2019, the first series production of heavy-duty lorries is expected to begin with notably Renault, Volvo and MAN. In the late 1990s, Chevrolet produced a small series of an electric S-10 pickup truck. In early 2009, Phoenix Motorcars introduced a test fleet of their all-electric SUT (Sports Utility Truck) to Maui. Miles Electric Vehicles imported the Chinese-designed ZX40ST electric small pick-up in the United States in the late 2010s. The Port of Los Angeles and South Coast Air Quality Management District have demonstrated a short-range heavy-duty all-electric truck capable of hauling a fully loaded 40-foot (12.2 m) cargo container. The current design is capable of pulling a 60,000 lb (27,000 kg) cargo container at speeds up to 10 mph (16 km/h) and has a range of between 30 and 60 miles (48 and 97 km). It uses 2 kilowatt-hours per mile (1.2 kW⋅h/km; 4.5 MJ/km), compared to 5 miles per US gallon (47 L/100 km; 6.0 mpg‑imp) for the hostler semi tractors it replaces. 1 U.S. gallon (0.83 imperial gallons; 3.8 liters) of fuel is equivalent to =33.7kwh, according to the US Department of Energy. This electric truck uses 2 kilowatt-hours per mile which is the equivalent of using only 10 kwh per every 5 miles (8 km). The diesel truck that it replaces uses the equivalent of 33.7kwh per 5 miles (8 km). Thus the diesel truck is using 3.37 times the amount of energy that the electric truck is using. Thus the only variables that are stopping commercial use of electric trucks are original vehicle cost and the driving range, owing to the high battery pack cost and low specific energy. As mass production happens the cost might eventually be comparable to diesel vehicles and with improvement in batteries the limited range of the electric truck might be a non issue. Volvo, DAF, MAN, Freightliner plan to begin series production of electric articulated lorries between 2019 and 2020. Electric tractors have been built since the 1990s. BYD does make electric tractors. A common example of the battery electric trucks is the milk float. Since it makes many stops in delivering milk it is more practical to use an electric vehicle than a combustion truck, which would be idling much of the time; it also reduces noise in residential areas. For most of the 20th century, the majority of the world's battery electric road vehicles were British milk floats. With a similar driving pattern of a delivery vehicle like the milk float above, garbage trucks are excellent candidates for electric drive. Most of their time is spent stopping, starting or idling. These activities are where internal combustion engines are their least efficient. These and other factors such as ease of driver training resulted in Birmingham City Council opting to use electric dustcarts to start replacing its horse driven carts in 1918. Its use of electric vehicles continued through a number of models including DV4s until 1971. Electric Dustcarts were also operated by Sheffield and Glasgow. In preparation for the 2008 Olympic Games, 3,000 of the internal combustion engine garbage trucks in Beijing were replaced with lithium ion polymer battery pack electric drive trucks. The batteries were procured for about $3,300 each. In France, some all-electric garbage trucks produced by Power Vehicle Innovation have been operating since 2011 in the city of Courbevoie, the first local authorities in France to acquired them. In 2014, North America became home to its own electric garbage truck. Called the ERV (electric refuse vehicle) it hit the road in Chicago in September 2014. It was the first of an up to $13.4 million purchase order for up to 20 trucks. The PO was won in a competitive bid by Motiv Power Systems in 2012. The majority of the money used to purchase the first truck came from a DoE grant secured by then-Senator Barack Obama. The City of Chicago runs the Motiv ERV on different residential refuse and recycling routes of up to 60 miles, saving 2,688 gallons a year. Chicago specified that this ERV must meet the demanding requirements placed on all of its garbage trucks. This included 60 mile range, a payload capacity of nine tons and 1000 pounds per cubic yard of compaction. These specifications make the ERV capable of use anywhere in Chicago. To supply enough electricity to move the truck and power the hydraulics all day, the ERV is equipped with 200 kilowatt-hours of energy, in ten battery packs. Full charge time is 8 hours using the Motiv Universal Fast Charger. Wrightspeed provides electric powertrain for garbage trucks and other medium-duty trucks. Some attempts to produce such lorries have been made, for example the one by PapaBravo. Electric mining trucks have the benefit of not polluting underground. In case of high-altitude mines, the downhill trip with ore recharges the batteries due to regenerative braking. The Renault Maxity is available with an electric powertrain (Diesel tow truck version pictured). Renault began selling an electric version of its Maxity small lorry in 2010. Renault was the first to build heavy-duty lorries, with various prototypes of electric Renault Midlum tested in real conditions by different customers for a few years from 2012. After these years of testing, Renault will commercialise its D and D Wide lorries from 2019. They will be built in France alongside their Volvo counterparts. Volvo will launch their first mass-produced electric FE and FL lorries in early 2019. They will be built in France alongside their Renault counterparts. Mitsubishi Fuso eCanter at the Tokyo motor show 2017. Mitsubishi Fuso began deliveries of the eCanter in 2017. Mercedes-Benz began delivering ten eActros units to customers in September 2018 for a two-year real-world test. Freightliner began delivering e-M2 lorries to Penske in December 2018, and will commercialise its larger e-Cascadia in 2019. DAF delivered its first CF articulated lorry to Jumbo for testing in December 2018.. It uses a VDL powertrain. MAN began delivering a dozen units of various e-TGM lorries (articulated, cooled, flatbed...) in September 2018 for testing purposes with different customers. A small series production will take place before a larger serial production scheduled to begin in 2022. A Class 8 fully electric Tesla Semi driving in Rocklin, California. Since January 2014, COOP Switzerland operates in the region of Zurich an 18 t truck with electric drive. 18 square meters of photovoltaic elements on the truck roof support the battery operation in addition. The truck has a capacity of 300 kW. The solar panels on the roof of the truck along with the recuperation provides 23 percent of the total energy of the vehicle. The range of the truck is 240 km per day. The energy consumption is 130 kWh per 100 km and after deduction of the energy from the solar system and recuperation, it is about 100 kWh per 100 km. A comparable diesel engine consumes about three times as much energy. The industry association Euro Solar European Solar Prize 2014 awarded in the category transport and mobility to Coop for the use of this electric truck. The truck, which the Swiss company E-FORCE had developed ONE AG weighs eight tons, has a gross vehicle weight of 18 tonnes and costs 380,000 Swiss francs. It is about twice as expensive as a diesel version of the truck. The truck is based on an Iveco Stralis chassis. The converted in cash consumption is 10 francs per 100 kilometers, with a diesel truck is 50 francs. According to Coop, the vehicle had a comparable diesel truck emissions concerning superior and equal in the economy. The truck has two LiFePO4 batteries with a capacity of 120 kWh with a weight of 1300 kg. The battery can be replaced within 10 minutes. The truck E-Force One won the 2014 German Federal Ecodesign. 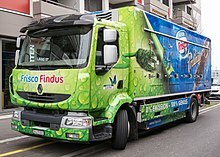 Two vehicles of this electric truck coming since mid-2014 even at Lidl in Switzerland  and a truck at the Feldschlösschen Beverages Ltd. are used. Since June 2015, such a vehicle at the company Pistor, Switzerland is in use. Even the shipping company Meyer logistics uses such refrigerated trucks in Berlin. The truck consumes an average of 88 kWh per 100 kilometers when used on the tours to city, intercity and highway routes. The company achieved energy savings by two-thirds compared to a diesel truck. The maintenance and the service life are not higher than a comparable diesel truck. The company wants to use other vehicles of this type. In 2018, Siemens and the South Coast Air Quality Management District have launched an electrified highway demonstration project near the Los Angeles Port and Long Beach Port, using overhead lines to supply the trucks with electrical power instead of relying on onboard batteries. 2 and the emission of sulfur oxides SOx and nitrogen oxides NOx is suppressed. The last truck was delivered in July, 2014. Since autumn 2014, the Swiss company acts as a general agent of CEEkon AG Emoss in Switzerland, Austria and Lichtenstein. In August 2013 the German discounter TEDi integrated a 12-ton Emoss electric motor truck in its fleet to supply several stores in North Rhine-Westphalia. The range is about 200 km, but thanks to opportunity charging a daily use profile of 300 to 400 km at one charge can be obtained. 2 per 100 km, can be saved. The 250 kW electric motor use LiFePO4 batteries with a capacity of 200 kWh, which are charged in less than 5 hours. On June 29, 2015, the company Niinivirta put a 16-tonne Emoss electric truck company into operation for the distribution of goods in Tampere (Finland). The Emoss CM1616 (base DAF LF55) has a 250 kW engine with an instant torque of 2700 Nm and 7 tons of payload. The LiFePO4 batteries have a total capacity of 160 kWh and are protected from the very cold conditions by a special isolation device. With a Fast Charger full charging takes only 3.5 hours. In 2011, GGT Electric, an automotive engineering, design and manufacturing company based in Milford, Michigan, introduced a new line of all-electric trucks for sale. GGT has developed LSV zero-emission electric vehicles for fleet markets, municipalities, universities, and state and federal government. The company offers 4-door electric pick-up trucks, electric passenger vans, and flatbed electric trucks with tilt and dump capability. The company Lithium Storage GmbH is building together with the company Kuhn Switzerland AG a battery-powered haul truck. The vehicle is to go the end of 2016 in operation. The dump truck weighs 110 tons. The chassis is a Komatsu 605-7. The vehicles have an electric motor with 800 hp and can thus produce 5900 Nm. The battery is a 600 kWh lithium-ion battery. For comparison, diesel vehicles of this type consume approximately 50,000 to 100,000 liters of diesel per year. In 2012, Motiv Power Systems announced its electric powertrain control system (ePCS) could be scaled to power any type of truck, from shuttle buses and Class-A school buses, to work trucks, box trucks, and even 52,000 lb (24,000 kg) garbage trucks. The Motiv kit can be used with almost any new truck maker's chassis or for an older truck retrofit. Motiv collaborates with existing truck manufacturers to allow them to sell electric options to their existing customers. Launched in 2006, the Newton electric truck is an all-electric commercial vehicle from Smith Electric Vehicles. The Newton comes in three GVW configurations: 7,500 pounds (3,400 kg), 10,000 pounds (4,500 kg) and 12,000 pounds (5,400 kg). Each is available in short, medium or long wheelbase. The truck was launched with a 120 kilowatt electric induction motor from Enova Systems, driven by Lithium-Ion Iron Phosphate batteries supplied by Valence Technology. In 2012 Smith re-released the Newton with new driveline and battery systems that were developed inhouse. Smith offers the battery pack in either 80kWh or 120kWh configurations. Newton was named Green Commercial of the Year in the electric vehicle section of Fleet Transport magazine's Irish Truck of the Year Awards 2010, sponsored by Castrol. As of October 2012[update], the Newton is sold worldwide and available with three different payload capacities from 6,100 to 16,200 lb (2,800 to 7,300 kg). The lithium-ion battery pack is available in varying sizes that deliver a range from 55 to 110 mi (89 to 177 km) and a top speed of 50 mph (80 km/h). In 2011, PapaBravo Innovations, an electric vehicle design, manufacturing and engineering company based in Saskatoon, Saskatchewan, Canada introduced a full line of heavy-duty underground mining trucks. These off-road 4x4 trucks are the first of their kind; a one-ton platform with full-time 4-wheel-drive capability. They have been designed specifically for "soft-rock" underground mining industries. The line of electric trucks ranges from 1/4-ton utility vehicles to 1-ton trucks and a 12-passenger personnel transport vehicle. BMW Group has commissioned an electrically powered 40-ton truck for transporting material on public roads. The vehicle comes from the Dutch manufacturer Terberg and commutes eight times a day between a logistics center and the Munich BMW plant. The truck battery takes three to four hours to charge. When fully charged, the vehicle has a range of up to 100 kilometres. Thus, the electric truck can theoretically complete a full production day without any additional recharging. Compared to a diesel engine truck, the electric truck will save 11.8 tons of CO2 annually. ^ a b Anderson, C. D., & Anderson, J. (2010). Electric and hybrid cars: A history. Jefferson, NC: McFarland. ^ Adler, Alan (8 March 2019). "2019 Work Truck Show: Adoption of Electrification Won't be Fast". Trucks.com. Retrieved 4 April 2019. ^ David Levine (June 17, 2009). "Creating a Buzz; A Sullivan County firm leads the way by selling alternative-power cars and trucks". Hudson Valley. Retrieved March 11, 2012. ^ Theresa Adams Lopez (2008). "Electric Truck Demonstration Project Fact Sheet" (PDF). Port of Los Angeles. Retrieved 2009-01-04. ^ Sripad, Shashank; Viswanathan, Venkatasubramanian (2017). "Performance Metrics Required of Next-Generation Batteries to Make a Practical Electric Semi Truck". ACS Energy Letters. 2 (7): 1669–1673. doi:10.1021/acsenergylett.7b00432. ^ "Electric tractors". Renewables.com. 2009-06-08. Retrieved 2010-11-27. ^ "Yanmar tractor conversion". Evalbum.com. 2005-12-30. Retrieved 2010-11-27. ^ BYD (May 9, 2017). "BYD INTRODUCES CLASS 8 BATTERY-ELECTRIC REFUSE TRUCK FOR NORTH AMERICAN MARKET". BYD. ^ "Escaping Lock-in: the Case of the Electric Vehicle". Cgl.uwaterloo.ca. Retrieved 2010-11-27. ^ a b De Boer, Roger F (1990). Birmingham's Electric Dustcarts. Birmingham & Midland Motor Omnibus Trust. pp. 8–10. ISBN 978-0905586076. ^ De Boer, Roger F (1990). Birmingham's Electric Dustcarts. Birmingham & Midland Motor Omnibus Trust. p. 21. ISBN 978-0905586076. ^ De Boer, Roger F (1990). Birmingham's Electric Dustcarts. Birmingham & Midland Motor Omnibus Trust. p. 25. ISBN 978-0905586076. ^ "Electric Drive Garbage Trucks in Beijing". Jcwinnie.biz. Archived from the original on 2010-10-17. Retrieved 2010-11-27. ^ "Advanced Battery Technologies, Inc. Signs Contract to Supply PLI Battery Cells for Electric Sanitation Trucks for 2008 Olympics". Marketwire.com. Retrieved 2010-11-27. ^ Sage, Alexandria (2011-05-05). "All-electric garbage trucks to sweep French streets". Reuters. ^ "See 40-Ton Electric Mining Truck In Motion". Inside EVs. 18 April 2018. ^ "eMining's eDumper is the world's largest electric truck". electrive.com. 23 April 2018. ^ "Renault Maxity Electrique déjà 100 000 km - Renault Trucks FRANCE". www.renault-trucks.fr. Retrieved 2019-01-06. ^ "MAN delivers electric truck eTGM to nine customers". electrive.com. 2018-09-16. Retrieved 2019-01-06. ^ Elektro-Lastwagen von Coop erhält Auszeichnung auf coop.ch, 23. Mai 2014. ^ Eurosolar verleiht Solarpreise auf photovoltaik.eu, 26. November 2014. ^ 20min.ch Detailhändler setzen auf Elektro-Lastwagen, 20. August 2014. ^ "Hytruck" (in Dutch). Retrieved 2016-03-09. ^ "Emoss successful-conclusion" (in German). Retrieved 2016-03-09. ^ "Emoss" (in German). Retrieved 2016-03-09. ^ a b "Elektrolastwagen Heineken" (in German). Retrieved 2016-03-09. ^ "ceekon" (in German). Retrieved 2016-03-09. ^ "Emoss CM1220" (in German). Retrieved 2016-03-09. ^ "Emoss CM1820" (in German). Retrieved 2016-03-09. ^ "16-Tonnen Elektrolastwagen von Emoss in Finnland" (in German). Retrieved 2016-03-09. ^ Jim Motavalli, Jim. "Starting an EV Company with 10 People, $5 Million and Chinese Suppliers". BNet.com. Retrieved July 30, 2009. ^ "GGT Electric E-Dyne 4-Door Cab Crew Truck". GGT Electric. Archived from the original on 4 June 2011. Retrieved 24 May 2011. ^ "GGT Electric Scout Hybrid Trucks". GGT Electric. Archived from the original on 17 August 2011. Retrieved 24 May 2011. ^ "Das weltweit grösste Elektrofahrzeug fährt demnächst in der Schweiz" (in German). 2016-03-12. Retrieved 2016-03-14. ^ "Smith Electric Vehicles - News". Smithelectricvehicles.com. Retrieved 2010-06-08. ^ Smith Electric Vehicles. "SMITH VEHICLES - Models and Configurations". Smith Electric. Retrieved 2012-10-08. Wikimedia Commons has media related to Electrically powered trucks.